Household items, Fisher-Price, Tonka and Structo etc. Toys, Cookie Jars, LaSalle & other car Parts Online Auction. You've been outbid to w****p! to YOU! Oak China Hutch w/middle dresser, 2 side lighted cabinets and top lighted mantle. Very nice and quality! 81'' wide x 20'' deep x 86'' tall.-NO SHIPPING! Queen bed w/oak headboard, 2 nightstands & 68'' wide dresser w/tri fold bevel mirror.-NO SHIPPING! Double bed Brass style headboard & Frame.-NO SHIPPING! 2 Pictures, Bulletin board & carry-on luggage.-NO SHIPPING! Kitchen Cart, white in color w/wood top and side towel bar.-NO SHIPPING! 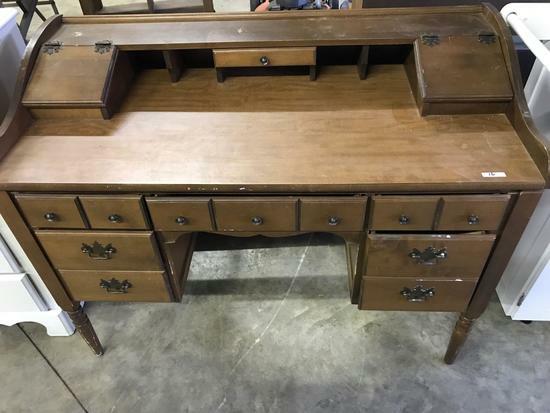 Kneehole desk w/pigeon holes and side drawers.-NO SHIPPING! Wood bookshelf & bevel wall mirror-NO SHIPPING! Hobnail Fenton pcs. plus a hand painted vase.-NO SHIPPING! 3 drawer cabinet w/open top drawer.-NO SHIPPING! G.E. Profile Gas Dryer, white. -NO SHIPPING! Danby Millennium model DCF40W 5.5 cu. ft. white Chest Freezer. -NO SHIPPING! Wood table & wall shelf. -NO SHIPPING! Wood bookcase w/2 bottom doors. -NO SHIPPING! 2 tier wood table -NO SHIPPING! Oak coffee & end table w/glass tops. -NO SHIPPING!